From 1st January 2015, New BJP Indian Govt. introduced new scheme which is called as "PAHAL" scheme. Which is also known as DBTL. From this scheme LPG consumers will get subsidised Cash subsidy to the customer's bank A/Cs from their LPG company. 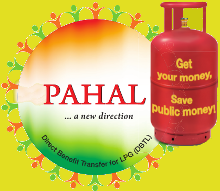 How to get benefit from this PAHAL Scheme? 1. To get subsidy direct into your bank account, you need to submit your Addhar card at your LPG Gas agency. 2. Or you can also submit your bank details to agency if you dont have Adhar card. 3. Or you can submit your LPG id to your Bank. After Submitting, the Que is when can you get Subsidy of a Subsidised cylinder? After LPG Cylinder refiling request, after 5-6 days your booked cylinder will dispatch to your home. On the dispatching time you need to pay for the whole cylinder price which is Rs. 608 (As on 1 Feb 2015), which includes RS 432 is cylinder price and RS 176 Govt. subsidy. After 4-5 business days your govt subsidy Rs. 176 will transfer to account like this transaction details. "NACH/IOC Ref NoXXXXXX018" - Meaning of NACH: NACH is National Automated Clearing House OR National Payment Corporation of India. Meaning of IOC: IOC or BP or HP is your gas agency and RefNo is your unique cylinder reference number. सन २०१७ मध्ये मला एकदाही एकही सिलेंडरची सबसिडी बँक खात्यात जमा करून देण्यात आली नाही.तरी मागील वर्षाच्या सर्व गैस सिलेंडरच्या सबसिडी माझ्या नोंदविलेल्या खात्यावर जमा केल्या जाव्यात हि विनंती.